Fringilla erythrophthalma Linnaeus, 1758, South Carolina. Four subspecies. English: Red-eyed towhee, rufous-sided towhee; French: Tohia flancs roux; German: Rötelgrundammer; Spanish: Rascador Ojirrojo. 7-8 in (17-20.5 cm); 1.2-1.8 oz (35-50 g). 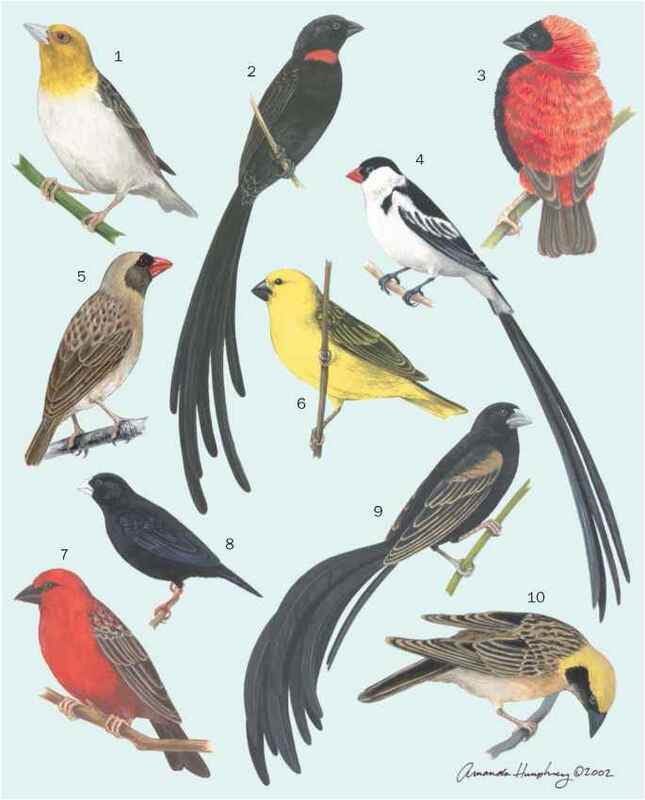 Sexually dimorphic, large, long-tailed sparrows. Males have a black head, throat back, and tail, white at the base of the primary wing feathers, rusty flanks, and a white belly. Females are patterned as males but are a warm brown where the males are black. Eye color varies from bright red in the north to yellowish or whitish in the southeast United States. Juveniles are brownish and are streaked below. 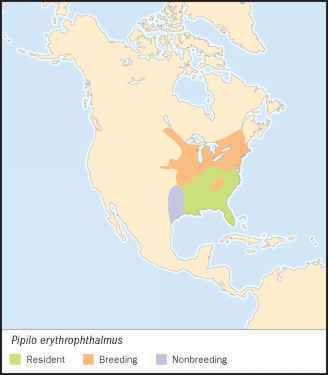 Breed from southern Manitoba, east across southern Canada, and south to Florida and the Gulf Coast (west to Texas). In winter, they migrate from the northern part of the breeding range southward and to eastern Texas and central Oklahoma. The four subspecies differ slightly in size and in eye color. Inhabit dense deciduous thickets or edges of woodlands. In the South they may be found in scrub palmetto. Solitary or occur in pairs or family groups. Males often sing from a conspicuous perch in the top of a tall bush or from a tree. When not singing they can be difficult to see. Forage on the ground by scratching in leaf litter for insects or seeds. Monogamous. The nest is placed in a depression in the ground under a bush or occasionally low in a bush or vine. Nesting occurs between April and mid-August. Clutch size is two to six (usually three to four) eggs. Incubation takes 10-12 days and young leave the nest after 8-10 days. Both parents feed the young.